The Icron USB Rover®1850 extends USB 1.1 connections beyond the desktop up to 85* meters without external power adapters over a single Cat5e cable, ideal for keyboards, mice, game controllers and interactive whiteboards – including all SMART Boards and Promethean ActivBoards..
Icron USB Rover® products operate over standard solid core Cat5e UTP cable (the same wiring used in Ethernet). The Icron USB Rover 1850 uses technology ideal for extending USB peripherals and does not require additional software for either the computer or the target devices. 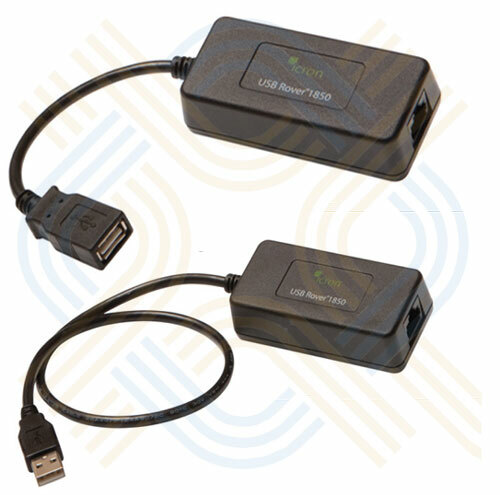 The USB Rover 1850 product is composed of two separate units: the Local Extender (LEX) and the Remote Extender (REX). Conventional USB cables are used to connect the LEX unit to the host computer, and the remote USB device to the REX unit. Cat5e UTP cabling is used to connect the LEX and REX units over a distance of up to 85m (279 ft).